Rittal’s AE Compact Enclosure passes the 25 Million mark! | Rittal - The System. AE enclosure series. Rittal’s unrivalled range of accessories begin with the mounting plate, and extends to the wall mounting bracket and much more. The mounting plate is quickly and easily fitted whether the enclosure is upright or horizontal. Standard gland plates are easily exchanged for gland plates with metal or plastic knockouts for simple, fast cable entry. Wall mounting brackets are easily attached to the enclosure from the outside, even retrospectively. Another innovative design is Rittal’s “space saving” accessory, the Installation Rail, which can be fixed to the side, floor or roof areas to create a larger internal workable area, easily doubling the mounting area within a small exterior enclosure footprint. 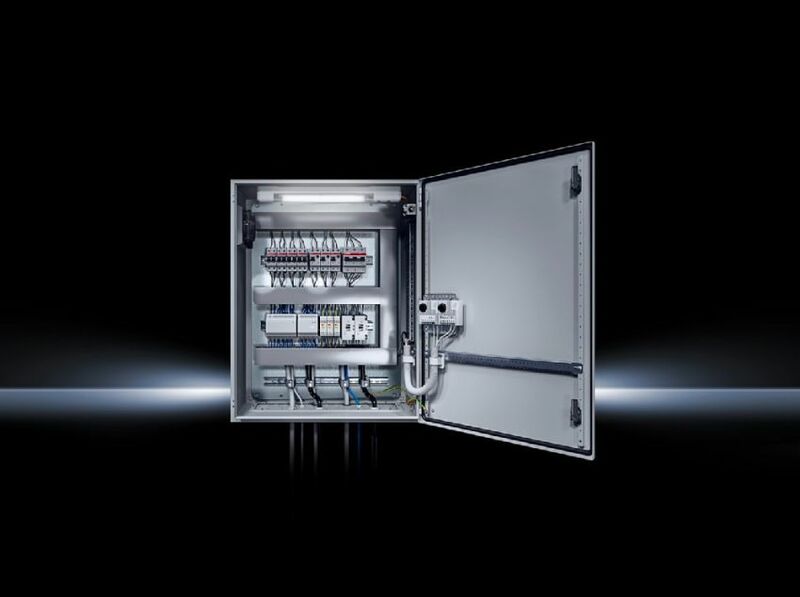 Compatibility with other Rittal accessories, such as door switches, light systems, fans, filters and connectors means an AE can easily be turned into a system enclosure. These can be installed easily and without any need for additional mechanical work within the enclosure. With millions of sales worldwide, it’s exceptionally high corrosion resistance remains one of its unique selling points, this is made possible by the three-stage surface treatment and paint process of the AE compact enclosures. This surface finish provides optimum corrosion protection and is resistant to mineral oils, lubricants, machining emulsions and solvents such as those used in cleaning. Rittal is the only enclosure manufacturer which offers paint quality comparable to that of the automobile industry as standard. Certified in protection ratings IP 55 to IP 66 to provide serious protection in harsh environments, the AE is available in over 75 variants including powder coated steel in light grey RAL7035, 304 and 316 stainless steel with 400 grain finish offering superior protection and durability. All parts are manufactured from a single piece of steel, seam welded, providing optimum strength.